Strike Fighter Squadron 213 (VFA-213) was formed in 1955, and is currently based at NAS Oceana. Also known as the “Blacklions,” VFA-213 began converting from the F-14 Tomcat to the F/A-18F Super Hornet in April 2006. The squadron became fully operationally with its AESA-equipped F/A-18 fighters in October of that year. 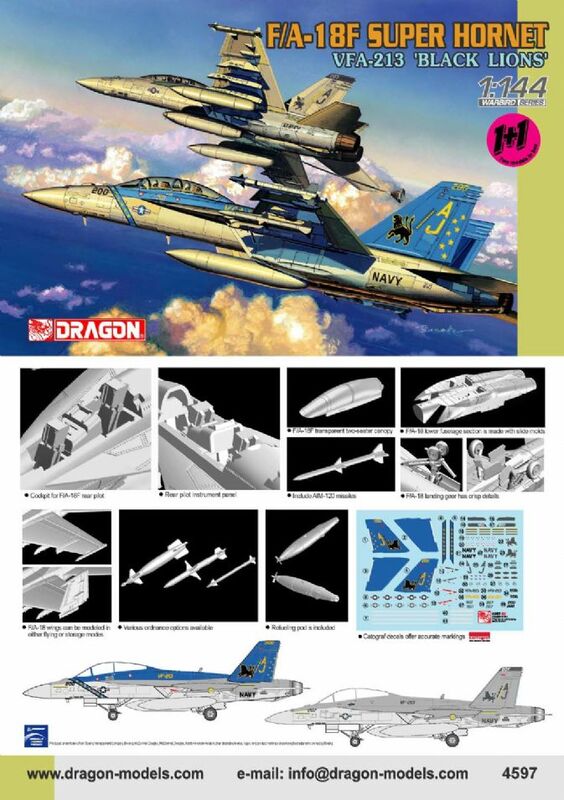 This model kit is a tanker version of the F/A-18F. It is fitted with a large fuel pod under the fuselage that is used for aerial refueling. The F/A-18 fills this tactical airborne tanker role that was left vacant with the retirement of the U.S. Navy’s KA-6D tankers. It performs a vital function, since the F/A-18 has a more limited range than the F-14 Tomcat it replaced.